Overton is surrounded by a forty mile network of interconnecting public footpaths and bridleways, all of them readily accessible from the village where there is free car parking for visitors. All the paths are clear and fully waymarked and cover a wide variety of attractive landscapes, riverside, woodland and pasture, many with extensive views. Until fairly recently many routes were obstructed or hidden but thanks to great efforts by Wrexham County Borough Council and the former Clwyd County Council all are now fully open for everyone to enjoy throughout the year. Overton resident Ken Farrell worked for many years on making the footpaths around Overton accessible. Keep watching this page for updates on further walks. 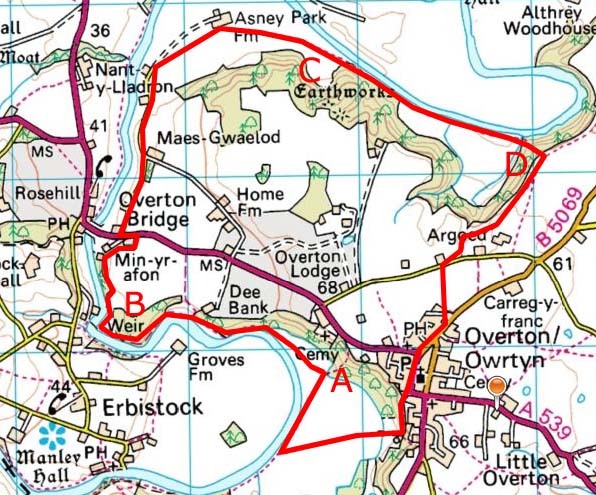 This is a lovely circular walk starting from the middle of Overton Village, and taking you along the Dee for much of the walk, before beginning the climb back through Asney Woods and back to the village.